I'm having trouble adding ingredients to my recipe. How do I reinstall Paprika 2 on my iPhone or iPad? I receive the error "That account does not support Reminders" when exporting my grocery list. My browser is "stuck" on a certain website. I am having trouble hearing the timer alarm. Why am I seeing ads in the browser? I'm having trouble sending email. The app has disappeared from my phone, or the open button is greyed out. Paprika's web browser works like any other web browser on your iPhone or iPad (e.g. Safari, Firefox, Chrome). If you tap on the address bar you can type in a new website to load, or you can tap on the bookmarks button to load a new bookmark. 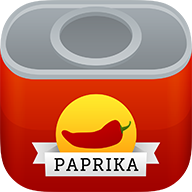 If you would like to return to Paprika's Sites page (http://www.paprikaapp.com/sites/), note that it is set up as the first bookmark in the bookmarks list by default.